A 37-year-old man who helped steal over £700 worth of items from Debenhams was given a three month prison sentence last Friday at Craigavon Magistrates Court. Jonathan Stewart Dickson, Glenavon Crescent, Lurgan, appeared in court by way of videolink from Maghaberry prison. He admitted stealing goods to the value of £709 from Debenhams on August 11 last year and going equipped for theft with a sports bag. The court heard that the defendant and a female were arrested for shoplifting. CCTV showed Dickson entering the store with a bag and the female handed him items which he put in the bag. A solicitor representing the defendant said he was no stranger to the court and had a chequered past. He explained that Dickson was currently serving a sentence with a release date of March 12. The solicitor added that the defendant had gone to Rushmere with his co-accused with no intention of stealing but the co-accused began handing items to him. 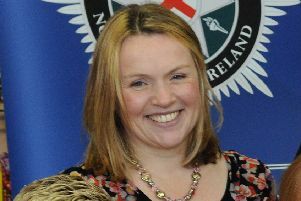 District Judge, Mrs Bernie Kelly, noted that Dickson had only one previous entry on his record for dishonesty but because of the volume of items involved there was only one penalty she could impose. For each offence she sentenced Dickson to three months in prison. The terms are to run concurrently with each other and concurrent with his present sentence.